Jim Carrey has been in a swag of great films and growing up seeing these movies was awesome. They were full of vibrance and vitality and above all were funny. Now seeing this at an older age (24) the complete hilarity that was once reminiscent has unfortunately not carried on to this day. Whilst the film is still funny the predictiveness is more apparent and is a little hit and miss in this title. 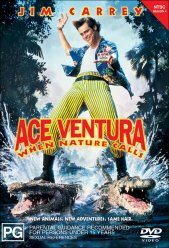 The story is this, Ace Ventura (Carrey) starts off trying to save the life of a helpless raccoon stranded on a rocky outcrop of some mountain in Tibet. The links to the movie Cliffhanger�s opening scene are inextricably obvious and is a great start to the film. After a little spiritual awakening in a monk�s temple he is then assigned to the mission of finding a white bat that has been stolen from the Wachati tribe in Africa. The clues are gathered by Ace who claims himself to be the master of disguise. Of course his methods are completely the contrary and the gags don�t stop coming until the credits start rolling. There are stunts with crashing trucks and a plenitude of animals joining the cast making an interesting variety to the picture. The assistant monkey being of particular note. One of the most humorous parts is when Ace and his monkey are tied to a raft and they are frantically trying to untie themselves whilst a huge waterfall is ahead�..I�ll leave the audience to speculate what happens. Other great parts are when Ace has to climbs out of a mechanical rhinoceros�s bottom with onlookers gasping in terror. The menu for this title is static whilst containing many informative bibliographies and directors notes on the making of the film. It is important to know that even looking at the actor�s backgrounds and production notes actually add to the experience of enjoying this film. Disappointingly other than the theatrical trailers there is no running film for all special features. There is no low-level noise that is certainly a good thing. This would spoil the appeal and humour in this film if there was any of those annoying black squares that we all love to hate. There are no lens washes to speak of; all colours are vibrant, clear and bright. The over the top antics of Jim Carrey are a bit of a mix of good and bad. Some are extremely funny while others seem a little over contrived. For the viewer who loves slapstick humour and Jim Carrey�s manic like behaviour would undoubtedly love this film. Basically it is recommended to younger viewers aged 12 to 21 or thereabouts. The sound is terrific as is par for the course with most DVD�s and can be experienced in Dolby 5.1. All speakers are used in this setting. Alrighty then, bye,bye now.